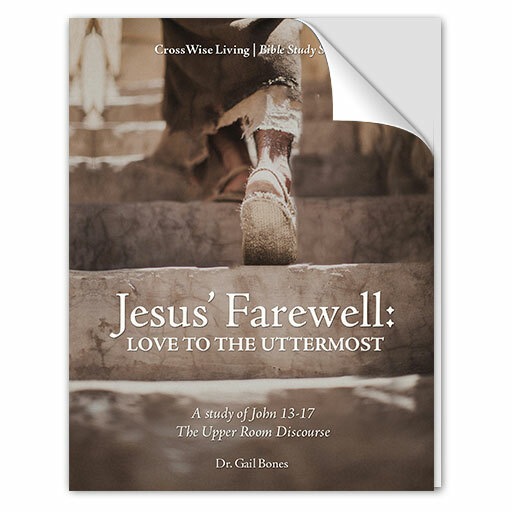 Jesus’ Farewell: Love to the Uttermost is the fifth in a series of in-depth, inductive Bible studies designed to be used by small groups or individuals. Discipleship resources created by CrossWise Living Ministries are designed to promote intergenerational ministry and mentoring relationships. Jesus’ Farewell: Love to the Uttermost is an in-depth discipleship tool designed to serve growing Christians who want keep going deeper in faith. This study is for you if want to know Jesus more intimately. There is no more tender portrait of our Lord in all of Scripture than that which the Apostle John depicts in the Upper Room Discourse. You will be captivated anew by the reality of Jesus’ humanity displayed in the depth of his emotion and loving compassion for his beloved band of brothers on the last night they were together. Are you ready to face challenging questions head-on? Willing to invest time in serious study of God’s Word? Do you desire to love Jesus more? Join us as we mount the steps to the Upper Room!